I decided to do this in a one shot, so if you don't want to read my responses, its only one blog post rather than 31 or so. Pretty much anything at this point, I've been going thru a bit of a slow period. I'd like to run basic D&D for the old school group at some point (they greatly prefer basic fantasy). And at some point I'd like to run the 5e group thru something other than 5e, even if its a one shot. Maybe advanced fighting fantasy 2.0. To tell you the truth, I think almost every base has been covered as far as genres are concerned. What might be interesting is an RPG based on HE MAN, and other 80s cartoons out there. 3. Where do you find out about new RPGs? Fifth edition - Curse of Strahd campaign. 5. Which RPG cover captures the spirit of the game? I really dig the red box cover, with the warrior and the dragon. That said the Erol Otus cover for S&W is probably my fav. 6. If you could game ever day for a week what would you do? I think I would run the birthright setting for 2e, and everyday would be "ex number" of years. So the whole week might end up being a 20 year campaign. That would be interesting, but probably a lot of math. 7. What was your most impactful game session? I think the very first old school group game, it was supposed to be a one shot, but ended up being a 12 game session campaign. Starting with "beneath brymassen" from the basic fantasy adventure anthology, then we did "the lizardmen of Illzathatch" and "tomb of gardag the strange" which was quite fun. 8. What is a good RPG to play for sessions that are 2 hours or less? 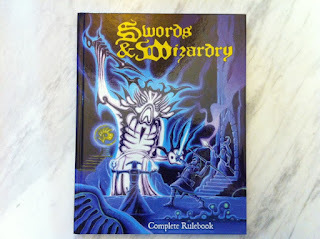 I'd say any iteration of Swords & Wizardry, you can get playing rather quickly. High up on the list of "nope!" would be 5e, due to character creation taking longer than 2 hours. Unless of course you use a pre gen. Even then I find that it drags a bit during play. We might have 1 encounter in 2 hours. 9. What is a good rpg to play for 10 sessions? I've played basic fantasy and 5e for more than ten sessions and enjoyed both of them thoroughly. It depends on who is DMing. 11. Which dead game would you like to see reborn? it's a board game, not an rpg technically. But if someone wants to put out new adventures for HerosQuest I'd be all over that! 12. Which RPG has the most inspiring artwork? Difficult question. I really dug the 3rd edition printing of Swords & Wizardy, as well the Whitebox Medieval Fantasy rules for art. As well lotfps Vaginas are magic. OH! and I totally forgot, pretty much anything DCC just gets me going, I love all the cover art, and the way they lay it out, etc. 13. Describe a game experience that changed how you play? I think that the more you play a game, the further you get into it. I remember first running KOTB with my wife & her cousin, they basically attacked everything. As time has gone on they have got a LOT better at role playing, not roll playing. I personally need to follow that lead when I'm a player and actually role play better. This of course is an ongoing thing. I think a set of rules that doesn't have a baked in setting is probably the best idea. I've waxed about how I dislike the realms, because of all the cannon involved. Even a game like a Star Wars RPG would be hard to run without destroying something in the universe. Best plan would be to get some dice and create your own setting and rules, then you can just really do whatever the heck you want right? S&W whitebox is infinitely hackable. I do enjoy playing with B/X however. 16. Which RPG do you enjoy playing as is? Advanced fighting fantasy 2.0 is great. Love the setting, and the revision to the rules. Just play it as is. 17. Which RPG have you owned the longest but never played? My Mom bought me a copy of "Dragon Knight" adventure module for DragonLance (2e) and I've never ran it. At some point maybe, it's the middle module of a set of 3. I've downloaded the other 2 and read them. As you know dragonlance can be a bit railroadey, but epic. Maybe I'll run it for the 5e group at some point. 18. Which RPG have you played the most in your life? Well the first rpg I ever got was the 2nd edition of AD&D, so I'll have to go with that one. As I said a little while ago, if I hadn't discovered the OSR I would A. Probably not be playing RPGs at all and or B. I would probably still be playing 2e. I'll wave the fan boy flag and say "pretty much anything that Gary's hands touched" . I'm currently reading the 1e DMG and there is some great stuff in it. I've read the 1st edition of greyhawk and it's very cool. As well some of the other adventures he's written (homlet, toee, kotb). Obviously everything he wrote wasn't gold, but there is a lot of good nuggets here and there. 21. Which RPG does the most with the least amount of words? Honestly probably second edition, as I've played it the longest. However I think my house rules mashup would be the actual easiest obviously. 24. Share a PWYW publisher who should be charging more? Whatever he or she needs to run a game, new adventures or RPGs you want to play, extra dice, mini's! For awhile our 5e group was buying each other bday presents. We got minis, campaign adventure books, core books. 26. What RPG provides the most useful resources? basicfantasy.org has a pile of great resources all of which are FREE! And a great community building more content daily. Imagination, good friends, a couple of nice craft beers. Obviously dice, and a good adventure to run. Oh and cheezies and mountain dew! 28. What film or series is the biggest source of quotes for your group? I hate to say it but for me it's totally Monty Python. There are also a lot of LOTR quotes, and a couple of GoT quotes thrown in for good measure. 29. What has been the best run kickstarter that you have backed? Any kickstarter that has already been written and ready to go. DCC and Frog God games have been very successful. Obviously the Midderlands is going to be good. 30. What is an RPG mashup you would like to see? How about a thundarr/he-man/john carter of mars with zombies, mechs and Cthulhu? That might be fun. 31. What do you anticipate most in gaming in 2018? I'd like to game more, run a long campaign with a bunch of characters. I'm sure there will be new 5e releases that someone will buy I can look at. I personally would like to release a bunch more adventures, time will obviously tell.